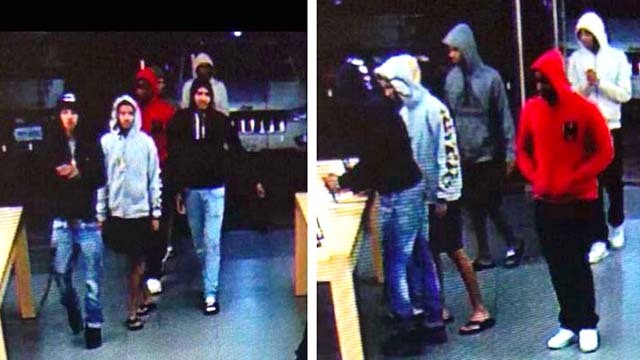 Authorities reached out to the public Wednesday for help in identifying a group of thieves responsible for a seven-month series of grab-and-run thefts at North County Apple store locations. The burglary spree in Carlsbad and Escondido has led to injuries in several cases and is thought to be related to similar crimes throughout California, according to police. In all, the losses statewide have exceeded $750,000, officials said. While carrying out the heists, the thieves — black men who appear to be in their 20s, possibly accompanied by a woman — have generally worn hooded jackets or sweatshirts with the cowls pulled up over their heads and mostly concealing their faces. In most cases, after scooping up high-end merchandise off display tables, the crooks have bolted to a waiting getaway vehicle. On several occasions, witnesses have been hurt while trying in vain to stop the fleeing robbers, police said. Surveillance cameras in the targeted businesses have captured numerous images of the thieves. Anyone who might be able to help identify the perpetrators is asked to call San Diego County Crime Stoppers at (888) 580-8477. Tipsters may remain anonymous and could be eligible for a reward of up to $1,000. 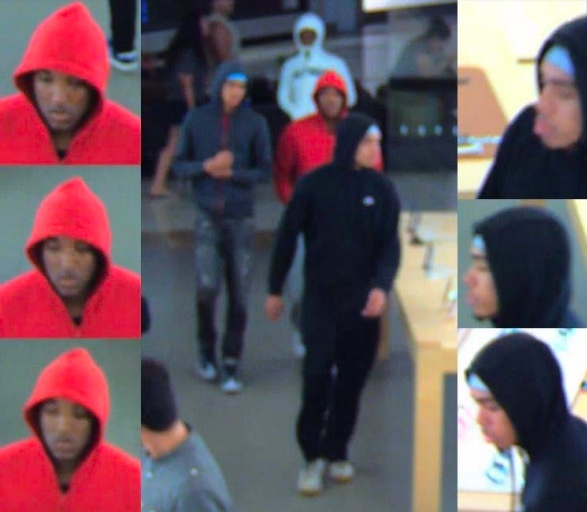 Surveillance video images of suspects at Apple Store in Escondido on July 9, 2018. Image via San Diego Crime Stoppers.